Throughout the last 15 months I have learnt a lot about myself and about the world around me. I’ve found a lot to be grateful for. Thanks to my chronic illnesses my life slowed down incredibly quickly at that point and this has given me the time to discover more about me and the simple, small things that can make a difference in your life and change a horrible day into an OK, or even a good or excellent, day. I believe the fact that I have been able to really focus on the small things going on around me as a result of, or despite of, my limited capabilities has been part of the reason I’ve been able to avoid clinical depression on top of my other illnesses. Each day I am able to identify and be grateful for at least one small thing that feels like a miracle, looks astonishingly beautiful, or is incredibly helpful in some tiny way. For example, over the last few weekends we’ve had quite a few clear days. On one of these days I was commenting how it was a great day because the sun was out and shining. My husband was saying it was a bad day because it was so cold. It’s all a matter of perception and what you focus on as to whether you have a good or a bad day. This past weekend, we were out weeding the front garden. Thanks to the rain the soil was loose and most the weeds were coming out easily which meant I was able to help for a little while without wearing myself out completely. The last section of the garden we were weeding was getting overgrown with small tufts of grass. These were annoying to pull out, and we were both feeling a bit over it at that stage. While pulling out the tufts of grass though I began to find these beautiful skeleton leaves. This reinvigorated me to keep going so that I could find more. They looked like little dragonfly wings and seemed magical to me. 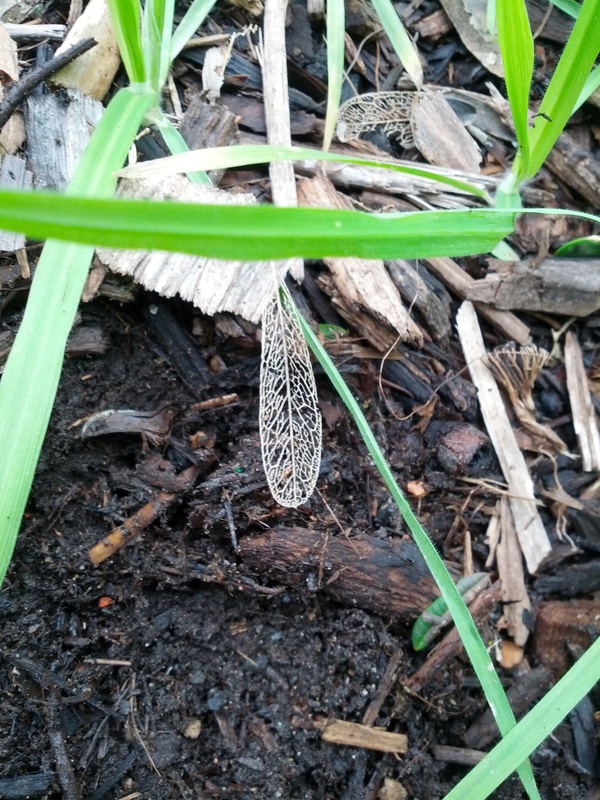 One of the magical leaf skeletons I was finding while weeding on the weekend. I feel that these two situations are great reminders to be aware and grateful of the small things happening around you. This is one of the steps of maintaining a positive attitude in the face of adversity. As I write this post I’m again grateful of the sunny weather, I’m sitting in the back garden soaking up the sun before going on with my day. Do you have any other tips for maintaining a positive attitude when facing adversity? Don’t forget to head over to the LiveKen site to read my most recent post. There will be a post here every Tuesday and on LiveKen every Thursday.